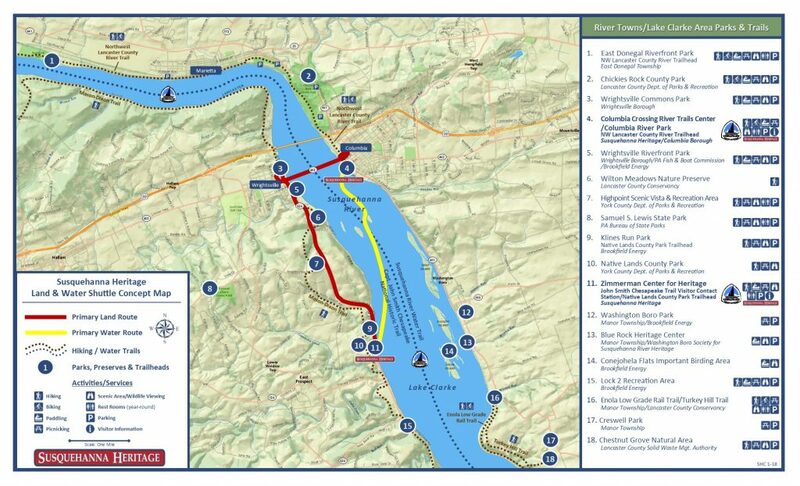 Susquehanna Heritage seeks a consultant team to conduct a feasibility study for land and water shuttle services in the River Towns and Lake Clarke areas of the Susquehanna River corridor through Lancaster and York Counties in Pennsylvania. The primary purpose of the study is to assess the financial and operational feasibility of transporting visitors between the Zimmerman Center and Columbia Crossing through a seasonal land and water shuttle service with on-board interpretive programs. This new service is intended to improve visitor readiness, expand visitor programs, and build visitation from outside the region. The Land & Water Shuttle Study will complement an Interpretive Master Plan for the Zimmerman Center, Columbia Crossing, and Native Lands County Park, which is currently underway. The consultant team selected for the Land and Water Shuttle Study is expected to coordinate with the Interpretive Master Plan consultant to ensure that proposed interpretive programs are compatible with and can be offered aboard the proposed shuttle services.